Nigeria is on the path to becoming the first country ever to cultivate biotech cowpea after the country's biosafety agency granted approval for the crop's cultivation by farmers. This development adds a new crop to the global biotech basket from Africa. 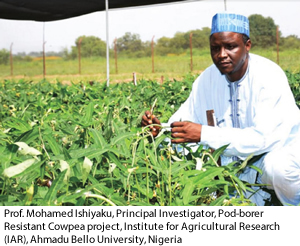 The National Biosafety Management Agency (NBMA) permitted the Institute for Agricultural Research (IAR) to commercially release Pod Borer-Resistant Cowpea (PBR Cowpea)-event AAT709A, genetically improved to resist lepidopteran insect pest Maruca vitrata. The permit is valid until the end of 2022. In a Decision Document dated January 22, 2019, the Agency said the issuance of the permit was made after taking into consideration the advice of National Biosafety Committee, National Biosafety Technical sub-committee and the risk assessment and risk management report provided by IAR, the applicant. "After a thorough analysis of the application dossier, Risk Assessment and Risk Management Plan prepared in connection with assessment of the application, it is unlikely that the proposed release will have adverse impact on the environment and human health," read part of the document. The approval is a culmination of more than nine years of intensive trials into genetically modified (GM) cowpea that can resist Maruca vitrata pod borer, an insect that can cause up to 80 percent yield loss. The release is a relief to millions of Nigerian farmers who depend on cowpea for food and income. Results from the research, led by Nigeria's Institute for Agricultural Research in partnership with the African Agricultural Technology Foundation (AATF), have shown that Bt cowpea will reduce the use of pesticides from eight to about two sprays per season and increase yield up to 20 percent. This means that Nigeria will record a revenue increase of more than N48 billion ($132 million) annually from cowpea. This is the second GM crop to be released in Nigeria after Bt cotton which was approved for open field cultivation last year. For more on the project contact Prof. Mohammad Ishiyaku at mffaguji@hotmail.com. View the decision document from NBMA.